The bumGenius Freetime makes cloth nappying so easy - the one-piece, one-size design features adjustable absorbency and a stay-dry inner lining. No stuffing or cover required, it goes on and off just like a disposable. Fast-drying and space for additional boosters if required. It grows with your baby all the way from birth to potty training. 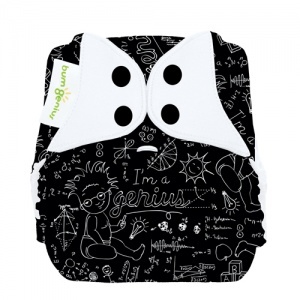 bumGenius Freetime All-In-One One-Size Cloth Diapers feature the patent pending butterfly closure system to provide a comfortable, trim fit. This simple design makes cloth nappies as easy as using disposables. The "no-stuff" system with sewn in, stay dry inserts is an ideal solution for families with a child in day-care or family members resistant to cloth nappies! Using the snaps on the front of the nappy, adjust the size if needed, put the nappy on your baby, wash, dry and re-use. No extra steps. No stuffing. No cover required. 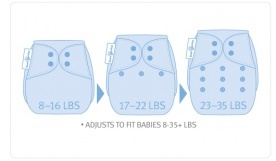 The one-size freetimes are designed to fit most babies weighing between 8 and 35 pounds. 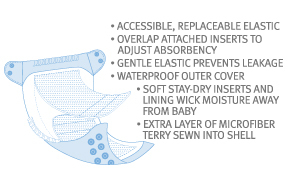 The soft, waterproof outer fabric keeps the cloth nappy trim on your newborn and/or toddler. Soft, sueded inner fabric gently wicks moisture away from your baby's skin. Super stretchy, gentle leg and back elastic with rolled out casings keeps the yuk in and help to keep red marks away. Fasten hook tabs to laundry tabs on slot cover. Pre-wash cold. Wash hot (140F/60C). Extra rinse. Line Dry - low. No laundry additives. No fabric softeners. I found that this nappy is super absorbent and is excellent for night time nappy change. We lasted for hours without leaking. Though it dries longer, I'd still recommend it!